Do Your Breasts Show These Five Signs of Aging? The shape of the breast becomes collapsed and droopy. Sensation decreased after breastfeeding, or implants, other surgery, or aging. Crinkling, crepe-paper skin around the cleavage area. Improve the shape and look of cleavage. Increase sensations that may have been lost after breastfeeding, surgery, implants, or aging. Treat the crinkling, or crepe-paper look around the cleavage area. Improve the appearance of stretch marks, sometimes with the use of mircroneedling to improve results. The procedure only takes about 45 minutes and has minimal pain. Some patients report a slight stinging or burning sensation. There’s also no downtime and you are able to return to work or normal activity immediately. The full effect of the Vampire Breast Lift® will take about two months, but you should see a noticeable improvement within a few days. It will last a year or longer and in some women, the results are permanent. How Does a Vampire Breast Lift® Work? What Happens After a Vampire Breast Lift®? If you have noticed irregularities in your breasts (sometimes due to aging) that you would like to have corrected, you may be a good candidate for a Vampire Breast LiftⓇ. The Vampire Breast LiftⓇ is not used for dramatically increasing cup size, and is therefore not for everyone. If you are interested in a Vampire Breast LiftⓇ, contact our office to schedule a consultation. 1) Evaluate Shape and locate where the shape can be enhanced to create a younger, more attractive appearance. 2) Prepare the growth factors for injection. The injector first isolates growth factors from the patient’s blood. When these growth factors are injected into the breast, many types of stem cells become activated and stimulate new tissue growth. This new tissue includes new collagen, new fatty tissue (for smoothness), and new blood vessels (for a healthy glow). Then the practitioner “activates” those platelets to cause the release of at least 8 growth factors that would normally be used to heal injured tissue. 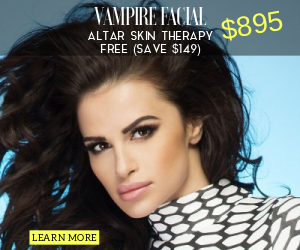 These growth factors work like magic to cause increased collagen and new blood flow. To rejuvenate new skin, these growth factors must be put back into your breast. Using numbing cream and a very small needle (for almost no pain), the practitioner injects the woman’s own growth factors back into her breast. These growth factors then activate many types of stem cells already in the skin (tricking them into “thinking” there’s been an injury and new younger tissue should be generated). The stem cells then develop into new collagen, new blood vessels, and new fatty tissue trying to “repair” the skin that was essentially never injured. The result…younger-appearing skin and increased volume of fatty tissue.